Survey Says Men's Rolex Watch Tops IPhone 5 for Most Wished for Holiday Gift. Over 16,000 affluent men were asked what they would most like to find hung from their stocking with care, and the results might surprise you. A survey was conducted recently by Bob’s Watches (the online Rolex Exchange for selling and buying genuine pre-owned Rolex watches at market prices) on the top Christmas gifts for men and an overwhelming number of respondents chose a gift few would have guessed. With the iPhone being so popular, it had seemed like nothing could beat its popularity. Click here to see the survey results. Would it be the classic Swiss timepiece that was ever-present on the wrists of such luminaries as President Dwight D. Eisenhower, Paul Newman, and Chuck Yeager, or did respondents prefer smart phones, sporting event tickets, jewelry, or clothes? You will be as surprised as we were. Which Rolex model came out on top? Amongst the specific models, the Rolex Oyster Perpetual Submariner, first designed for diving and later featured in eleven James Bond movies, was a solid contender, but did it beat the iconic Rolex President, or the Rolex Daytona, which has become scare ever since Jenifer Anniston was spotted on the runway with her rose gold model? The Rolex President holds the honor of being the first watch to display the day and date in its entirety; the Rolex Cosmograph Daytona is the archetype of the sport watch for racing drivers; and the Rolex Oyster Perpetual Date GMT Master was originally designed for pilots and navigators. What would be your favorite gift to receive for the holidays? Other questions asked on the survey including preferences on smart phones and sporting event tickets. Would respondents choose the cache and ease-of-use of the Apple iPhone, or would they prefer the increased screen size, battery life, and photo clarity of the Samsung Galaxy S III? And would respondents prefer tickets to America’s pastime, baseball, over football, basketball, and the like? Click here to see the survey results. Bob’s Watches prides itself on being the first and only e-commerce site to focus on both selling and buying used Rolex watches in a user-friendly and secure platform. Headquartered in California, with a fulfillment center in Huntington Beach, more information can be obtained by calling (800) 494-3708. Bob’s Watches is the World’s First and only Pre-Owned Rolex Exchange where consumers can buy, sell, and trade pre-owned (used) Rolex watches at true fair market value. They openly publish the current buy and sell values for each Rolex model allowing them to serve as an online marketplace for buyers and sellers looking to get the best deal. They are devoted exclusively to only used Rolex watches and pride themselves on obtaining the very best results possible for their customers. Their business philosophy is built on trust and integrity and in a very short time they have become the leading online destination for pre-owned, authentic Rolex watches. 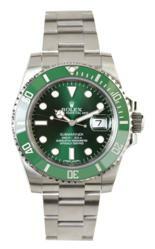 And unlike other online watch companies, Bob’s carries an actual inventory of watches. Every watch on the site is in stock ready for sale. See http://www.BobsWatches.com to learn more.